Excitement was in the air when research scientist Dan Slayback of NASA’s Goddard Space Flight Center in Greenbelt, Maryland, approached a small trio of islands in the South Pacific island nation of Tonga. It was October 8th, and Dan had joined the scientists and students with the Sea Education Association’s SEA Semester South Pacific cruise to visit a three-year-old island he’d only seen from space. “There’s no map of the new land,” Dan said. 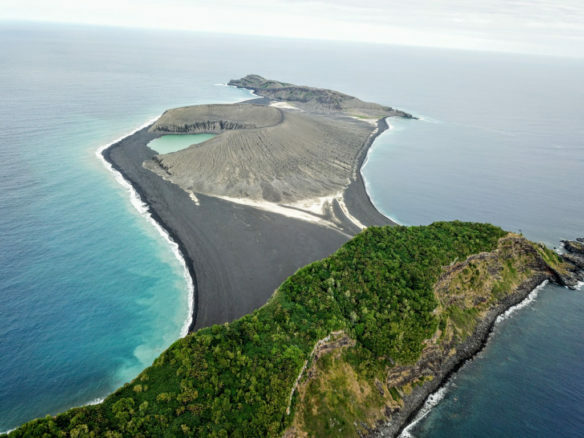 It erupted from the rim of an underwater caldera in early 2015, nestled between two older islands. The older islands were on some nautical charts at coarse resolution, and the satellite observations appeared to show shallow beaches on the south side of the new island that would allow them to land. However, while satellites are powerful tools for looking at land on Earth, they are not omniscient about all the details on the ground – these beaches turned out to be too steep and the waves too rough for an easy landing.